Washington, District of Columbia, administrative offices are located at 1350 Pennsylvania Avenue, NW, Washington, DC 20004; phone: 202-727-6300. 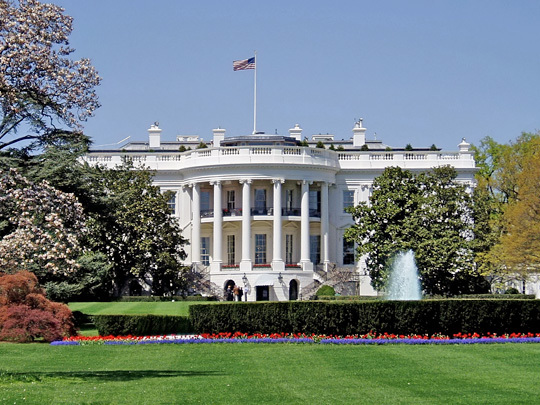 Photo: White House, 1600 Pennsylvania Avenue, Washington, D.C. Perhaps the most-recognizable residence in the world. Photographed by Matt H. Wade, 2006, (own work) [cc-by-3.0 (http://creativecommons.org/licenses/by/3.0)], via Wikimedia Commons, accessed October, 2012. Prior to the organization of the City of Washington, the entire territory that became the Federal City was part of some thirty tracts of land, known in their entirety since 1715 as Rock Creek Hundred. Rock Creek Hundred was originally part of Charles County and, later, Prince George's County, Maryland. Most of the settlers of the territory were farmers who raised tobacco, wheat, corn, and cattle. Other individuals, including merchants, bricklayers, and carpenters, who worked and lived in Georgetown or the larger municipality of Montgomery County, Maryland, began in the mid-18th century to purchase land in the area as a speculative venture. In 1791, when the site of the new nation's capital was officially designated, nearly half of the original proprietors who deeded their land in trust for the new city were merchants and businessmen anticipating benefiting from the birth of the city. From the Tidal Basin to Rock Creek Park, Washington, D.C.,'s magnificence comes as much from its urban landscape as from its buildings. Large green expanses such as the monumental Mall and the Potomac parks, and small triangles along the avenues landscaped with trees and benches, provide generous areas of open space throughout the historic city. Coupled with the building-height restriction that allows sunlight to reach the streets, the system of open spaces connected by wide avenues gives Washington an undeniable openness. While Washington has few structures that date to its founding, this network of avenues, streets and open spaces, designed in 1791, remains largely intact today. Although threatened during its 200-year history—and in several instances, violated—the original design of Washington is a landmark urban plan meriting study, assessment, and preservation as it enters its third century. A congressional act of July 16, 1790, empowered the president of the United States to appoint three commissioners of the District of Columbia to layout the city and oversee the construction of government buildings. Andrew Ellicott (1754-1820) and Benjamin Banneker (1731-1806) surveyed a diamond-shaped area measuring ten miles on each side and encompassing the forks of the Potomac River and its Eastern Branch, the Anacostia. Forty stone markers, each a mile apart, were erected to mark the boundary from the celestial calculations of Banneker, a self-taught astronomer of African descent, and one of few free blacks living in the vicinity. Within this 100-square-mile diamond, which would become the District of Columbia, a smaller area was laid out as the City of Washington. Major Pierre Charles L'Enfant (1755-1825), a French artist and engineer who had formed a friendship with George Washington while serving in the Revolutionary War, asked for the honor of devising a city plan for the roughly 6,111-acre area that would become Washington. The thriving port of Alexandria was located on the southern edge of the ten-mile-square, and another port city, Georgetown, was located within the diamond west of Rock Creek, a tributary of the Potomac River that defined the northwest boundary of the planned federal city. Within the city boundaries, towns called Hamburg and Carrollsburg had been already been planned on paper, although neither had been laid out on the land. A census of Prince George's County shows that the area to become the City of Washington was occupied by twenty households consisting of 720 persons: thirty-seven free white males older than 16, thirty-five free white males under 16, fifty-three white females, four other free persons, and 591 slaves. The fact that the area was largely undeveloped gave the city founders George Washington and Thomas Jefferson, as well as Pierre L'Enfant, the unique opportunity of creating a capital city that would define the identity of the nation it would serve. After surveying the site, L'Enfant developed a plan in the baroque tradition of ceremonial spaces and grand radial avenues while respecting the natural contours of the land, in the manner of a picturesque English garden. The result was a system of orthogonal streets with intersecting diagonal avenues radiating from two of the highest points in the city, selected as sites for buildings to house the congress and president. L'Enfant specified in notes accompanying the plan that these avenues were to be wide, grand, and lined with trees, and situated in a manner that would visually connect ideal topographical sites throughout the city where he envisioned important structures, monuments, and fountains. On paper, L'Enfant shaded and numbered fifteen large open spaces at the intersections of these avenues and indicated that they were to be "divided among the several States in the Union, for each of them to improve, or subscribe a sum additional to the value of the land for that purpose." He speculated that the city would develop more rapidly and its population would be more evenly distributed if each of the states participated in its beautification. The plan of the capital would reflect the nation it represented. The squares, named for the states, would be separate unto themselves, yet be "most advantageously and reciprocally seen from each other ... connected by spacious Avenues round the grand Federal Improvements ...," much like the United States themselves bound together by the Constitution. L'Enfant specified that each reservation would feature: Statues, Columns, Obelisks, or any other ornaments, such as the different States may choose to erect; to perpetuate not only the memory of such individuals whose Counsels or military achievements were conspicuous in giving liberty and independence to this Country; but also those whose usefulness hath rendered them worthy of general imitation: to invite Youth of succeeding generations to tread in the paths of those Sages or heroes whom their Country has thought proper to celebrate. The urban landscape could hereby embody and perpetuate accepted values and ideals as long as these national idols presided over the city from their pedestals. L'Enfant's scheme also displayed five grand fountains supplied by several of the area's more than twenty natural springs. Fountains, statues, and the general scheme of radiating streets with parks and vistas were surely products of L'Enfant's admiration of Versailles, where he spent much of his childhood. The aesthetic and symbolic concepts embodied in Andre Le Notre's (1613-94) landscape plan for Sun King Louis XIV were, ironically, transferred to the new democracy across the Atlantic. By emulating the baroque plans of such auspicious empires as Rome and France, L'Enfant set forth his high hopes for the prosperity, longevity, and international importance of the new country. L'Enfant's plan even foretold the manifest destiny of America to someday encompass the vast expanse from the Atlantic to the Pacific oceans. At the site of today's Lincoln Park, he envisioned "an historic column — also intended for a Mile or itinerary Column, from whose station (a mile from the Federal house) all distances of places throughout the Continent [were] to be calculated. Thus, for L'Enfant, the open spaces were as integral to the capital as the buildings to be erected around them. Along with the streets and avenues he delineated, these circles, squares, and triangles were the city's only reality — they defined the voids that would be divided into lots to be sold and developed. The integrity of the plan was so important to L'Enfant that he jeopardized his livelihood to preserve it. While clearing New Jersey Avenue south of the Capitol site, L'Enfant's workmen encountered a partially constructed house with walls projecting 7 ft. into the planned right-of-way for the road. The house belonged to Daniel Carroll, a nephew of one of the three commissioners in charge of the District of Columbia. Carroll refused to relocate the house, so L'Enfant, allowing nothing to violate his vision, ordered his men to raze the structure. In response, George Washington admonished him, "Having the beauty and regularity of your plan only in view, you pursue it as if every person, and thing, was obliged to yield to it. This incident, while exhibiting the extent of L'Enfant's dedication to his ideals, also displayed the stubbornness that would later cost him his job. While L'Enfant concerned himself with vistas and avenues, Washington and Jefferson oversaw the real estate transactions that would finance the physical development of the city. At the suggestion of Georgetown businessman George Walker, they used a unique scheme for obtaining the land from the original proprietors, with all of the transactions contingent upon the yet-unfinished city plan. The government would purchase the land designated for federal buildings for $66.67 an acre. The proprietors would donate to the federal government land set aside for streets and avenues. The remaining acreage would be divided into city blocks, and each block would be further subdivided into lots. The lots in each block would be distributed evenly between the federal government and the original owners. Anticipating that the value of the land would increase significantly, the original proprietors retained only 16 percent of their original holdings, turning over 84 percent of it to the federal government. Proceeds from the sale of the federally owned lots would fund construction of government buildings and the improvement of streets and parks. L'Enfant, believing the premature sale of lots would hinder the city's development, failed to provide the commissioners with a map in time for the first sale in October 1791. The sale was a resounding failure with only thirty-five of 10,000 potential government lots sold not only foreshadowing the apprehension of investors that would plague the city for years to come, but also solidifying the commissioners' resentment toward L'Enfant. Reluctantly, George Washington relieved L'Enfant of his post and engaged surveyor Andrew Ellicott to produce a map for the second sale scheduled for the following spring. "Historic city" is defined as that area encompassed in the original plan, namely, the area north of the Anacostia and Potomac rivers, east of Rock Creek, and south of Florida Avenue and C Street, NE. Philip W. Ogilvie, "Chronology of Some Events in the History of the District of Columbia," Office of Public Records, District of Columbia, ca. 1988, 12. Pamela Scott, "Pierre L'Enfant: A New Look at the Architect and his Plan," Washington, D.C. at 200 lecture series, National Geographic Society,Washington, D.C., March 25, 1991. References on L'Enfant's 1791 plan of the city. Albert E. Cowdrey, A City for the Nation: The Army Engineers and the Building of Washington, D.C.. 1790-1967 (Washington. GPO, 1978). 8; and Elizabeth S. Kite, L'Enfant and Washington (Baltimore: Johns Hopkins Press, 1929),93-96. Although the term "block" has been used here for clarity, in Washington, blocks officially were and continue to be called "squares." Frederick Gutheim, Worthy of the Nation (Washington, D.C.: Smithsonian Institution, 1977),23-24; Paul D. Spreiregen, On the Art of Designing Cities: Selected Essays of Elbert Peets (Cambridge: MIT Press, 1968), 5; George Speer Colyer. "The L'Enfant Plan in Downtown Washington: Its History and Prospects for Survival" (MA thesis, George Washington University, 1987), 53. Albert E. Cowdrey, A City for the Nation: The Army Engineers and the Building of Washington, D.C. 1790-1967 (Washington. GPO, 1978). 8; and Elizabeth S. Kite, L'Enfant and Washington (Baltimore: Johns Hopkins Press, 1929), 93-96. Frederick Gutheim, Worthy of the Nation (Washington, D.C.: Smithsonian Institution, 1977),23-24; Paul D. Spreiregen, On the Art of Designing Cities: Selected Essays of Elbert Peets (Cambridge: MIT Press, 1968), 5; George Speer Colyer. "The L'Enfant Plan in Downtown Washington: Its History and Prospects for Survival" (MA thesis, George Washington University> 1987), 53. †Library of Congress, Historic American Buildings Survey, HABS DC-668, L'Enfant-McMillan Plan of Washington, DC, Washington, District of Columbia, memory.loc.gov, accessed November, 2011.